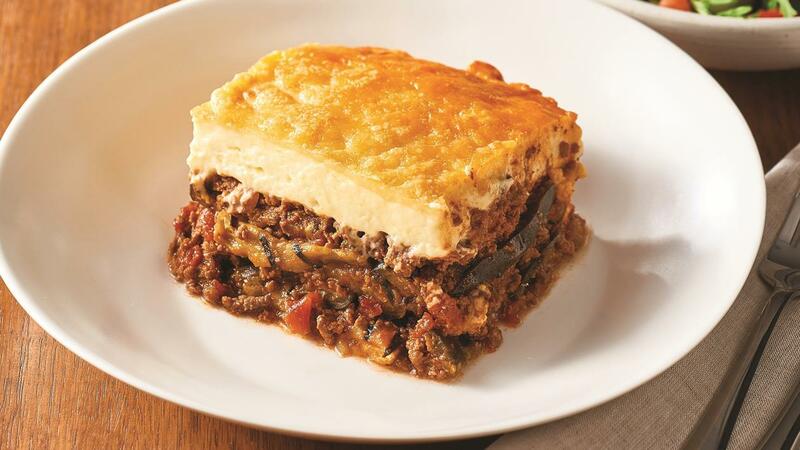 Add variety to your menu by serving this Greek-style dish using lamb mince and three layers - similar to lasagne, finished with a top layer of béchamel sauce and cheese. Sautee the onion and lamb in oil in a large pot. Add KNORR Pronto Napoli and simmer for 30 minutes. Slice the eggplant into 5mm thick strips and place on a large baking tray sprayed with Real Ease Cooking Spray. Cook at 180C in the oven until lightly browned. Remove and allow to cool off. Bring milk and KNORR Concentrated Liquid Stock to boil. Whisk in KNORR Roux until thickened. Place a layer of eggplant at the bottom of the tray, top with some lamb mix and repeat this step two more times. Finally cover with the white sauce mix, sprinkle with remaining cheese and bake until golden at 180C. Tip – Add grilled zucchini slices and potato to this recipe for a vegetable loaded version.